I feel like the title should say in parenthesis "And being the daughter of Santa" ! Happy ALMOST Christmas! ACK! Who has their shopping, wrapping, decorating and baking done? Not me! I did take time though to make one of my husbands favorite soups, and I wanted to share our food tradition as a child in my family since it includes this! 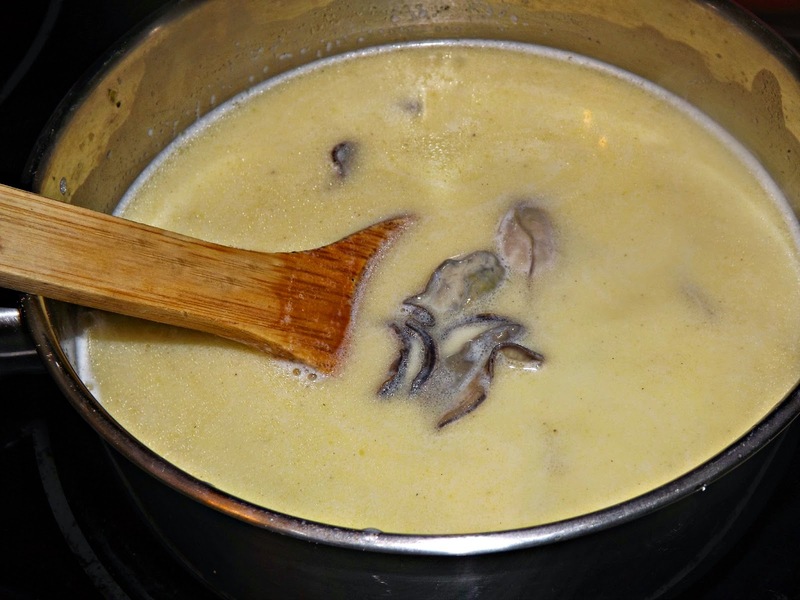 What says "Christmas" like oyster stew? Well it does for me anyway, my mom always made oyster stew on Christmas Eve. My family always opened gifts on Christmas Eve. Christmas morning we woke up to what Santa had left us! Ok, wait, let me back up. (You know there is a story here) My dad has played Santa for probably 50 years or more. He has a beautiful suit, he is a jolly man, who has the perfect build for Santa! 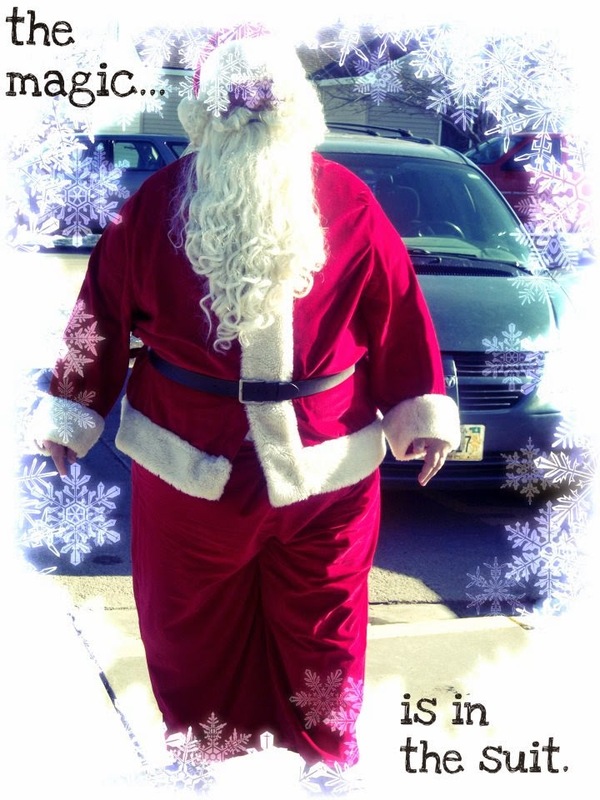 (wink) He was always Santa at all of our local stores, movie theatre and local events. MANY times we sat on his lap, asking for our biggest dreams, having no idea it was our own daddy under that beard and wig. Magical, to me, it is just magical as an adult looking back. As we got older, and grandkids came into the picture, we had an "incident". My nephew Brandon, probably 4 or 5 at the time, walked into Grandma and Grandpa's bedroom while we were getting "Santa" ready. He stopped dead in his tracks, almost like time stood still. He said, "Grandp..Santa"? Well, now that creates a problem with about 10 other grandkids in the other room, doesn't it? (and about 10 more that would come later along with the greats!) So it became common knowledge to the grands in the family that Grandpa was one of Santa's "helpers". That realistically Santa couldn't get everywhere in one night, but they couldn't tell their friends because he wouldn't be able to keep his special suit and make so many children happy. Hey, call it what you want, it has worked for a good 30 years now! We would white shoe polish all of his facial hair since he had black hair, even when he shaved it looked dark, cherry red the tip of his nose, cheeks and lips, double side tape his moustache in place so his beard would fall in a perfect wave down his rich red velvet jacket. His wig, was smoothed and perfectly fixed before he it was topped off with the magical hat that seemed to instantly transform him into the real Santa. We would pull up his boots topped with white fur, then on went the snow white gloves and his little wire rimmed glasses. He would gather his big red bag that "Mrs. Claus" made and off we would go. Lots of us kids helped but a few of us loved it more than others. He took these jobs on Christmas Eve to help fund Christmas for his own 10 children and wife. Starting at about 5pm, one of us, or a couple of us would drive him from job to job, there would be gifts left in garages, in cars, in backyards, and in dog houses. He would fill his bag with them and knock on the front door, or just burst through as he would turn his head and holler back out the door "Come on Blitzen, calm down" or "Donner, don't you take Rudolph's carrots" or other similar lines. Sometimes we would peek in windows undetectable to absorb some of the Christmas joy being spread by the man we simply called "dad" but always knew he was made to be, lived his life just like, and in our hearts WAS the REAL Santa. We helped him deliver a horse with her mane adorned in tinsel, in the snow and ice, up a huge icy hill. We had to get her at a local stable and walk her to her new home! There were puppies, kittens, and one of the most moving deliveries was a simple candy cane, to a woman lying in her bed, taking her last breathes. She wanted Santa to bring her a candy cane. In small towns word travels fast and he had heard of her last wish. So he entered her home with a gentle "HoHoHo", walked her bedroom that had not much more than a bed, and a light bulb hanging from a wire. With snow falling outside her window on that Christmas eve he gave her, that candy cane and witnessed the smile of an angel. He kneeled beside her to pray and as she grabbed his white gloved hand she said, "It's really you Santa". Her last words. He was infamous for entering mass right after communion, during the time we call meditation. He would enter through the back of the church in his santa suit, walked quietly down the center aisle to the stares of disbelief of every child (and adult) there. He knelt at the nativity, removed his hat, and later admitted that he shed a tear and prayed for all children and families to be healed, happy, and always know the love of Christ. He got up, put his hat back on, and walked quiet as could be right back out. Sometimes he couldn't resist a faint "HO HO HO MERRY CHRISTMAS TO ALL" as he exited. I am guessing you could hear a pin drop for the next 5 minutes. Here is a photo of the last time my dad was able to dress up. We hold our Christmas celebration in a school gymnamsium since there are so many of us, 10 kids, spouses, grandkids, great grandkids but he always tried to dress up and make sure all of the kids sat on Grandp--oops, Santa's lap. I will cherish this photo forever, this is my dad, the giver, the miracle worker, the rescuer, the selfless human who will take the shirt off of his back for a stranger, (and has). The loving, supportive father, who would be surrounded by his children and grandchildren everyday if he could. He was born to be Santa and in our hearts he always will be. Now, he is just able to sit back in his grandpa clothes, and enjoy his family together, kids, grandkids, and great grandkids. He is in all of his glory when he has his family near. This is how I grew up celebrating Christmas Eve. I wanted to share it with you, so you could experience the magic of how the day went for me. After my dad was done, he would come home, sneak in the back door, get cleaned up and join us for dinner. which was ALWAYS, chicken noodle soup, potato soup and oyster stew. 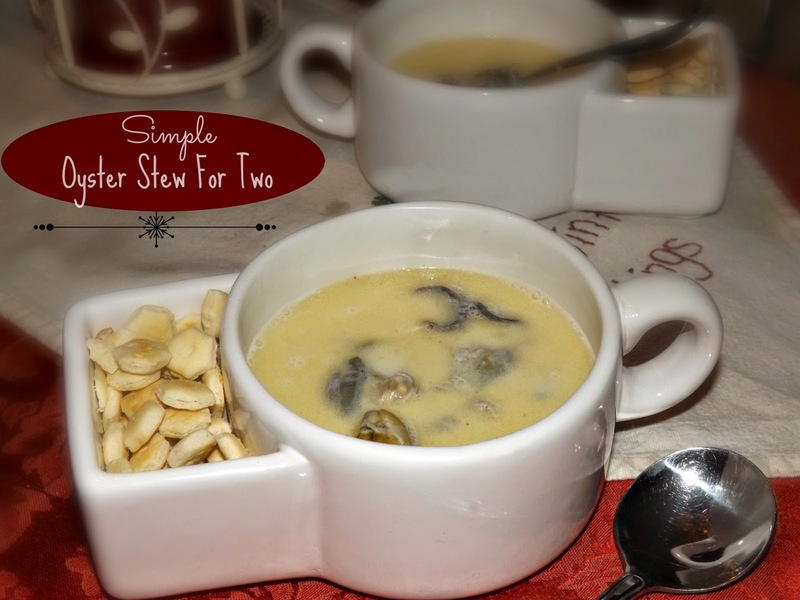 We were a large struggling family so oyster stew was a holiday treat that was not afforded any other time of year. In the middle of the rural Midwest you don't get fresh oysters either, so my mom would use those from a can which is exactly how I made mine for you. We would have deli meats and cheeses for sandwiches, then open gifts and then get dressed in our new Christmas dresses and suits and head to midnight mass where my mom was the choir director and organist. Memories.......... Thanks for letting me share mine with you. If you are able to get fresh oysters, I would use a dozen for this recipe. Keep the liquor, the juice from them, you will need it! Even if you used canned, keep the juice! This will generously serve two, maybe 3. So if you need a bigger batch just double it or triple it. I used 2 cans of oysters because my husband loves them but one is really probably enough for most people. I will leave that part up to you. This is three ingredients plus salt and pepper, does it get much easier? In a medium sauce pan melt your butter. While it is melting drain your oysters but KEEP the juice! 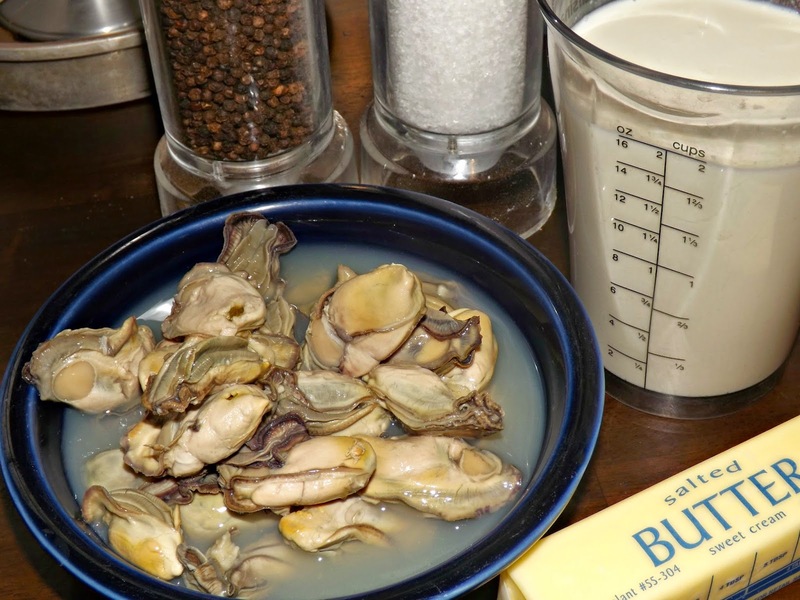 When the butter is melted, add in just the liquid from the oysters and the half and half. Let simmer for 3-4 minutes, until it is almost simmering. Add in oysters and simmer for 2-3 more minutes. If you are using fresh oysters, as soon as you see them start to curl they are done. Don't over cook this or they will be tough! Now salt and pepper to taste and serve! Could it be easier? It is silky, and perfect. My mom would be proud, and Santa, well, Santa would be to busy to eat a bowl, but wouldn't mind, because spreading joy to the world is exactly what my dad does. People will jokingly say, "You know, if you don't believe in Santa (insert a plethora of endings). I always reply with "I know Santa is real, he is my dad". What a sweet story of love, magic, and dreams! This is the kind of stuff Ellen Degeneres gets crazy about, Chris... you should send this post to her!! Thank you Becca, I appreciate your sweet comment. Your friendship is golden, and I wish you the very Merriest Christmas!